Simply because of this article (which I stumbled upon because it was about a local Nashville filmmaker named Tony Vidmer) am I now completely intrigued by… want to know more about… and can’t wait to see the movie “High Roller“. 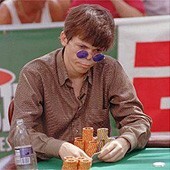 The movie is about a young poker legend, Stu Ungar, (aka Stuey “The Kid” Ungar), who was a man with a gift for cards. Vidmer’s small-budget, biopic movie about poker legend, Stu Ungar, was shot in only 22 days, and definitely seems worthy of a watch. “Stuey” was featured at the 2003 Nashville Film Festival where it won a top audience award. What Made Stu Ungar Unique? Stu Ungar was a child prodigy of sorts… with cards at least. At the age of 10 he won his first gin rummy tournament. At the age of 14 he began to play poker (professionally!) while being backed by the Mob. By 27, he was a World Champion Poker player. Ungar went on to win the World Series of Poker (WSOP) 3 times: 1980, 1981 and 1996. Despite the fact that he had won millions, Stu lived his life self-destructively, and it all caught up with him when died at the young age of 45 — found dead in 1998 in a Las Vegas hotel room (a $58 adult-movie motel) with $800 in his pocket. The movie Rounders — a movie which many claim helped launch the current poker craze. The book One of a Kind — a book about the rise and fall of Stuey “The Kid” Ungar, the world’s greatest poker player.